Inside a furniture-free caravan in the Jordanian desert, sixteen women and girls and a plump boy wedge themselves in a circle around a 15-year-old girl and a woman doing her hair. The hairdresser combs through one-inch sections, spraying on a fixative before twisting them into elaborate shapes. The girl, whom I’ll call Nada (I’ve changed her name as well as others’ to protect their privacy), is one of hundreds of thousands of refugees who have fled to neighboring countries from Syria’s civil war. We are in Jordan’s Zaatari refugee camp—now the second-largest in the world—and Nada is getting married today. After Nada’s geisha-like makeup is done, three women will sprinkle her body with talcum powder, minus the parts covered by leggings and a bra. She will step into a rented dress and then spend three more hours waiting on a floor mattress in the heat before meeting her husband between caravans, in a field of pebbles that extends to the horizon in all directions. 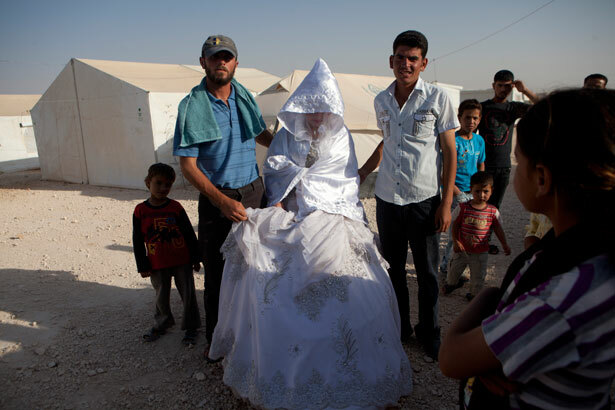 This is marriage, Zaatari-style. Unlike the custom in the Syrian town of Dara’a, where the couple is from, there will be no lavish spread of food, no music, no throngs of joyous relatives, few gifts. And since there is no light for an evening celebration, everything will happen before sundown. “We’re celebrating, but the joy doesn’t come from the heart,” the bride’s father, Mohamed, 35, tells me. Like many men in the camp, Mohamed decided to hand over his eldest daughter early for marriage to protect her as well as to get a little money for his family. He says he worries about the girls Nada associates with: there are rumors that many are turning to prostitution to feed themselves. He worries that Nada will be raped if she remains single. And he fears she’ll lose her childhood no matter what he decides. While some media outlets have been reporting that early marriage is on the rise among Syrian refugees, most NGOs working on this issue in Amman told me that Syrians are simply carrying on the traditions they brought from home, where girls in rural areas often marry between the ages of 15 and 20. In fact, Nada and Mazen’s marriage is illegal. The age of consent in Jordan is 18, which means that Nada and Mazen are committing a crime if they don’t apply for a special waiver (according to the UNHCR, Jordanian law applies in Zaatari). It also means that any child they have will be considered illegitimate, which will damage the child’s social status and make it more difficult to acquire Jordanian nationality and documents. According to the US State Department, the minimum marriage age in Syria is generally 18 for boys and 17 for girls, though exceptions are possible if both parties consent. There are also the health risks associated with early marriage: the World Health Organization reports that complications related to pregnancy and childbirth are the leading cause of death for girls between the ages of 15 and 19 in low- and middle-income countries. Girls who marry early often leave school, stunting their potential for any work beyond manual labor. And while Syrian mothers and fathers told me they want to marry off their girls because they fear they will face violence if they remain single, the WHO says girls who marry before the age of 18 “have a greater risk of becoming victims of intimate partner violence than those who marry at an older age,” especially if there is a large age gap. At Zaatari, I met girls who, unlike Nada, had been or were about to be married to much older men, many from countries other than Syria who had come fishing for young brides. Reem, 16, has a tiny voice diminished by illness brought on by camp dust. Like Nada and Mazen, Reem is from Dara’a, an agricultural area where the Syrian uprising began in the spring of 2011. Reem’s husband, a 25-year-old Libyan food distributor, came to Zaatari seeking a bride three or four months ago. He gave Reem a watch, perfume and water. They married in front of a couple hundred guests at a wedding hall in the nearby town of Irbid, staying there for a month before Reem returned to Zaatari. Now she’s waiting for him to return; he’s busy in Tripoli securing her a passport, she says. That he calls every couple of days may indicate he actually plans to return, but I’ve been told that many men pass through Zaatari taking on brides for just days or a month or two. Wearing only a dented gold wedding band for jewelry and with her hair covered by a pink leopard-print hijab, Reem shyly smiles when I ask if she wants to go to Libya. Yes, she says, she does—because her husband tells her it’s like Syria: “green, with lots of water.” Will she miss her family when she moves to Libya? “Definitely,” she says. But marriage, Reem says, is “better than being single.” Like many of the girls I met at Zaatari, she does nothing all day; she stopped school in ninth grade because of the war. And, again like many of the girls I spoke with, a veil of depression hangs over her face no matter what we talk about. Reem’s mother, who has been sitting quietly a few feet away, leans forward, directing my attention back to the issue at hand: her daughter’s marriage. “Her life is better now,” she says, bringing the conversation to an abrupt end. Before Nada’s wedding, as we wait for the completion of the marriage contract, I’m invited into a nearby caravan ringed with maybe a dozen men, including a local sheik. They pass around tiny cups of cardamom-flavored coffee and cellphones with videos displaying the war’s brutality: I’m shown scenes of men in fatigues stabbing a dead body repeatedly and dragging another with its scalp hanging half off. Flies cluster on the thin mattresses we’re sitting on. The air is heavy with the mid-afternoon heat and concentrated masculine gloom. It’s as if the wedding preparations twenty feet away were taking place in a different world. A few of the men confide that they regret coming to Zaatari. One tells me he is seriously considering returning to Syria with his family. After an hour of horror stories, the men are pointing and grabbing at my notebook and pen, thrusting them into the hands of my translator. Before I realize what’s happening, she is copying down words spoken by the sheik, transcribing the wedding contract. The bride’s family, she writes, will receive 125,000 lira for the marriage and 125,000 more if there is a divorce. There is no romance or sweetness. Four men sign as witnesses. With that, the wedding is done. We emerge into the area between tents and caravans, still warm in the late afternoon sun, and wait for the bride to meet the groom at a gray Kia Sport van, which will “protect their honor,” Mohamed says, by driving them 500 yards to the borrowed caravan in which they will spend their honeymoon. Once the couple are squished alongside the bride’s mother in the back seat, a male relative gives money—gifts from the wedding guests—to the bride’s mother. He hands it to her one note at a time, shouting a brief prayer for each well-wisher as he does so. The total is about 20,000 lira ($205). The estimated cost of the wedding is 70,000 lira ($719). Everywhere in Zaatari, I meet young brides. marriages happen daily, and children, from the looks of it, are born in great numbers too. A young woman, 23, offers to tell me about her unhappy marriage. Requesting that her name not be used, she says that in the year she’s been here, her husband has taken up with “a different girl every week.” He’s about to take a second wife, but in the meantime, he comes to her tent and beats her “every single day.” She’s the first of a number of women I’ll meet in Zaatari whose husbands are taking second wives, and the first of many I’ll hear about who are enduring domestic violence. Without hope of escaping the daily assaults, and concerned for her four kids and the one growing in her belly, this woman refuses to report the violence to authorities; she fears her husband will kill her if she does. She tells me about a 15-year-old neighbor who just married an “old Jordanian man” who paid the girl’s family 100,000 lira. A Jordanian man also asked this woman’s family if he could marry her 12-year-old sister. Her mother said no, she tells me, but that’s not a choice many families feel equipped to make in the face of poverty and war. “Families have so many kids, they just marry off the daughter to whoever comes,” says Masarra Sarass, head of the Syrian Women’s Association in Amman, which processes 400 new refugee families a week. The stories come at me for days, not just in Zaatari but as I travel throughout the region interviewing Syrian refugees. One teacher in Zaatari says that men from Gulf countries have asked her where they can find young girls for marriage. A 15-year-old in Beirut tells me that an “old Lebanese man,” a local mufti, comes daily to ask her mother for her hand in marriage. Every day, he shows up and tells her sick father that he would be happy to take the burden of this daughter off the family’s hands; every day, her mother says no. Every girl I speak with between Amman and Beirut has either been considering early marriage or knows a friend or a neighbor who has. Early marriage has become so prevalent that it has caught the notice of Zaatari’s authorities. The UNHCR is now implementing a campaign to stop the practice, emphasizing the illegality of the marriages and pointing out that many don’t last more than a month. The idea, I was told, is to make it clear that smooth-talking older men are not necessarily filled with good intentions for underage girls. As the sun finally nears the horizon, Nada and Mazen are secure in their honeymoon caravan. A clump of henna is stuck to the door, symbolically gluing the couple together for life. A few dozen people continue to talk outside and nibble on pistachio-topped sweets. I return to the family’s caravan and find Mohamed in the dusty area outside the houses, where chickens wander around barrels, piles of wood and strung-up laundry. We sit on a flimsy bench with our backs to a UNHCR tarp. I ask him if he’s happy for his daughter. He tears up. “If we were in Syria, we would have gotten more money in gifts,” he says. What else was wrong with the wedding? “There would have been shooting…the contract should have been written on a bigger piece of paper,” he says. He quickly clarifies that he’s not focused entirely on the physical: “It’s about pride,” he says. Lauren WolfeTwitterLauren Wolfe is an award-winning journalist who writes for Foreign Policy, The Atlantic, The Guardian, and elsewhere. She is on Twitter at @Wolfe321.